Reprinted with permission of the News-Register. By Starla Pointer, September 24, 2018. When it was time to enroll in higher education, Cason Cunningham looked for a school that not only met his academic interests, but also would accept the G.I. Bill and offer other supports specific to his unique needs as a military veteran. He found the right combination at Linfield College. Cunningham wasn’t thinking of Linfield when he was a student at Sheldon High School in Eugene. He had two uncles in the Marines, as well as a grandfather who’d served in the Navy during World War II. Naturally, he was thinking about the military himself. He joined after graduating in 2011. And on Jan. 3, 2012, he reported for basic training in San Diego. Being away from home was difficult, at first, especially since he missed his sisters, one in college and the other in high school. But joining the Marines was right for him, he said. A machine gunner, Cunningham was trained to operate a truck-mounted 40-millimeter grenade launcher. The ship sent him from San Diego to Hawaii to the Philippines to Korea to Middle Eastern countries such as Kuwait, the United Arab Emirates and Bahrain. His ship also sailed to Djibouti, on the east coast of Africa, the poorest place he’d ever seen, he said. While he’d received “decent” grades in high school, Cunningham said he realized he hadn’t put forth the effort he could have. But he was ready to be serious when his four-year stint in the Marines concluded. 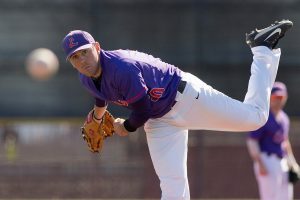 He considered enrolling at Linfield because alumnus Stan Manley, who coached Cunningham’s high school baseball team in Eugene, reached out to him. Manley now coaches at the college. The senior is now preparing for baseball season while completing courses for his history major and education minor. He’s fulfilling a part-time student teaching job this fall at Duniway Middle School, where he said he’s paired with a great mentor teacher. “He gets the kids excited about history. I hope I can be half as good as he is,” he said. In the spring, Cunningham will have a full-time student teaching position at McMinnville High School. Cunningham also is working on his senior thesis in history. His topic is the Vietnam War. He is especially interested in U.S. history. But he said the experiences as a Marine helped him put the history of any country or period in context, he said. As a veteran, he was able to use G.I. Bill money to pay for his education. It would have covered the cost of a public school, he said, but not the total cost of Linfield. 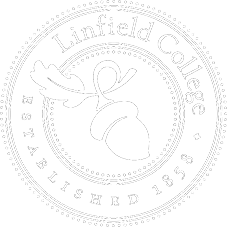 Since Linfield is a registered “Yellow Ribbon” school, however, that program made up the difference. Yellow Ribbon made it possible for him to enroll, he said. Once he arrived on campus, he learned that Linfield also offers a support system for veterans. He said the staff in the financial aid department, such as Tara Kleinberg, have offered “amazing help” in organizing his G.I. Bill/Yellow Ribbon funding. He’s also heartened to see other vets among classmates. There are 42 veterans on the McMinnville campus and in the continuing education/online program, and 10 at Linfield’s nursing school in Portland, according to Norena Koffelt of the financial aid office. Cunningham is also excited that new president Miles Davis is a Navy veteran. Davis was an anti-sub warfare operator who monitored the path of enemy submarines from a plane. The president, like Cunningham, said veterans speak a common language. It can be frustrating, Davis said, to hear people without a military background offer opinions on military topics. And they may have had traumatic experiences to which the general public can’t relate. It helps vets to be able to discuss their experiences with people who understand, Davis said. With that in mind, he hopes to establish a veterans’ center where such open dialogue can occur. This entry was posted in Uncategorized and tagged Cason Cunningham, G.I. Bill, Marines, Miles Davis, Navy, Norena Koffelt, veterans, Yellow Ribbon program. Bookmark the permalink.